When we are overtaken by emotions or a situation causes our heart to become heavy, it is then our prayers are lifted to the only one who is stronger than us and is our only hope in this life! (Psalm 61:1-4). 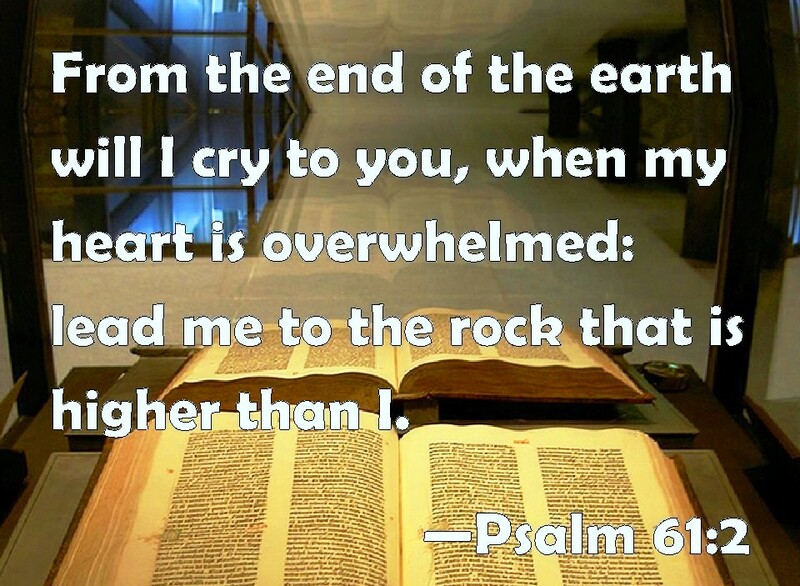 Hear my cry, O God; attend unto my prayer.2 From the end of the earth will I cry unto thee, when my heart is overwhelmed: lead me to the rock that is higher than I.3 For thou hast been a shelter for me, and a strong tower from the enemy.4 I will abide in thy tabernacle for ever: I will trust in the covert of thy wings. Selah. The disciples were overwhelmed with sorrow when they knew Jesus was about to go back to His Father in heaven, but He reassured them that it was to their advantage because He would sent the comforter known as the holy spirit (John 16:5-16). 5 But now I go my way to him that sent me; and none of you asketh me, Whither goest thou?6 But because I have said these things unto you, sorrow hath filled your heart.7 Nevertheless I tell you the truth; It is expedient for you that I go away: for if I go not away, the Comforter will not come unto you; but if I depart, I will send him unto you.8 And when he is come, he will reprove the world of sin, and of righteousness, and of judgment:9 Of sin, because they believe not on me;10 Of righteousness, because I go to my Father, and ye see me no more;11 Of judgment, because the prince of this world is judged.12 I have yet many things to say unto you, but ye cannot bear them now.13 Howbeit when he, the Spirit of truth, is come, he will guide you into all truth: for he shall not speak of himself; but whatsoever he shall hear, that shall he speak: and he will shew you things to come.14 He shall glorify me: for he shall receive of mine, and shall shew it unto you.15 All things that the Father hath are mine: therefore said I, that he shall take of mine, and shall shew it unto you.16 A little while, and ye shall not see me: and again, a little while, and ye shall see me, because I go to the Father. There is one who understands every trial and grief any one of us encounters, and that is the Lord we serve (Matthew 26:36-39), 36 Then cometh Jesus with them unto a place called Gethsemane, and saith unto the disciples, Sit ye here, while I go and pray yonder.37 And he took with him Peter and the two sons of Zebedee, and began to be sorrowful and very heavy.38 Then saith he unto them, My soul is exceeding sorrowful, even unto death: tarry ye here, and watch with me.39 And he went a little farther, and fell on his face, and prayed, saying, O my Father, if it be possible, let this cup pass from me: nevertheless not as I will, but as thou wilt. (Isaiah 53:3-5).